Some basics and examples on animations. 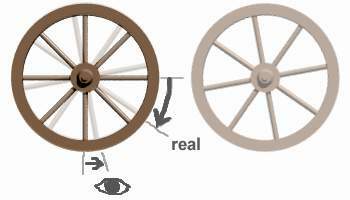 About spoke wheels rotating in the opposite direction. Nearly everyone who ever had looked an old western movie has discovered this paradox effect: The wheels of a stagecoach some times seem to stop or seem to rotate in the opposite direction. Everyone knows this cannot be real, but we saw this really! The drawing above shows how this effect in movies, videos and computer animations appears. The deeper reason of the realised rotation in the opposite direction is based on the fact that a movie is a fast sequence of single images - our brain is interpolating this to a continuous motion - most times this works very realistic, but sometimes we also see miracles. The effect of seeing a rotation in the opposite direction occurs always if a spoke of a wheel rotates by more than the half distance of the spokes during one frame and the next. Calculated rotation: to the right! The wheel turns more than a half spoke distance! It seems to turn to the left! Wrong direction! The wheel turns less than a half spoke distance! It seems to turn to the right! Correct direction! This effect may also occur with gears, with propellers with many blades, with the paddle wheels of a Mississippi steamboat, with moving grid patterns and many similar things.